A belligerent man who fought with cops after he was found trespassing inside a South Carolina home told officers that his name was “Lee Oswald Trump,” according to a police report. 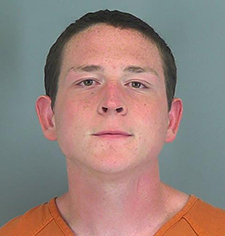 The suspect was collared yesterday afternoon inside a Spartanburg home, where police also arrested three other trespassers. Of course, jailers could find nobody with that name in their computer systems. So, police issued the man a ticket “under the name Lee Trump” while they sought his actual identity. Eventually, investigators determined that “Lee Oswald Trump” was actually Christopher Kelly, 21. In addition to the trespassing rap, Kelly (seen above) is facing charges for resisting arrest and providing a false name to law enforcement.